You should never judge a book by its cover, as the saying goes, and this is certainly the case with this extraordinary Hong Kong abode. 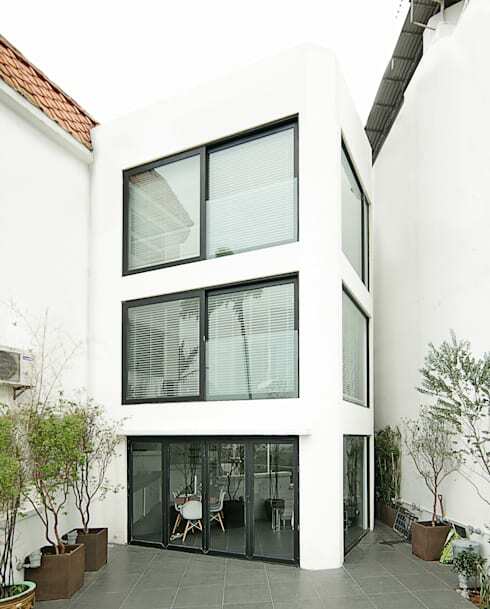 Located in a quiet city neighbourhood characterised by boxy white houses, this home truly packs a design punch. One By Nine interior architects have transformed a simple space into an extravaganza of black and white, replete with private bamboo forest! Cosy, comfortable furnishings warm the home, adding a welcoming touch to its stark decor, while sleek finishes in the kitchen and bathroom contribute the utmost in modern style. Beyond the high walls of the exterior rests a peaceful, private courtyard, paved in chic grey and awaiting outdoors activity. In a city in which space is a luxury, this home is truly a treasure to behold. 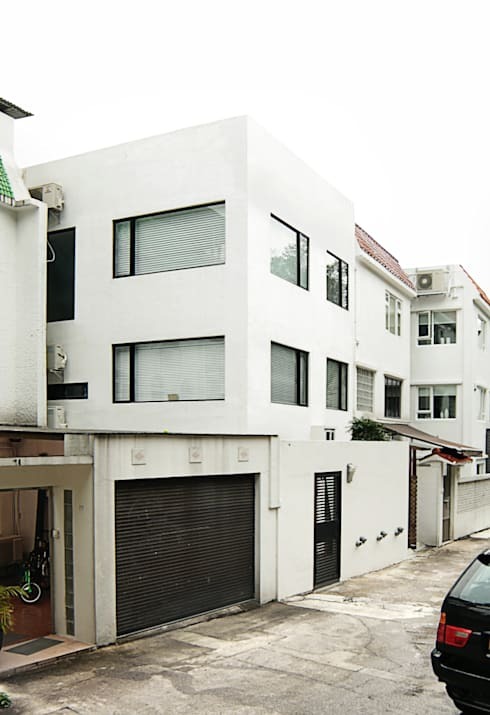 When first viewing the facade of this beautiful home you could be forgiven for thinking it was just one in a number of plain, white multi-level houses on an unassuming Hong Kong street. Blending into it surroundings in humble privacy, the home's outward appearance is understated, barely giving an indication of the luxurious interior laying in wait to delight occupants and visitors. The interior is an entirely different story however, with no detail overlooked. The shell of the home has been left exposed, with the white walls and black sheen of steel beams creating a stunning contrast and infusing the home with a slightly industrial feel. The coffee tones of the living and dining room furnishings soothe the space and provide ample vantages from which to admire the striking indoor greenhouse, with the vibrancy of thriving bamboo filling the space with an emerald glow. 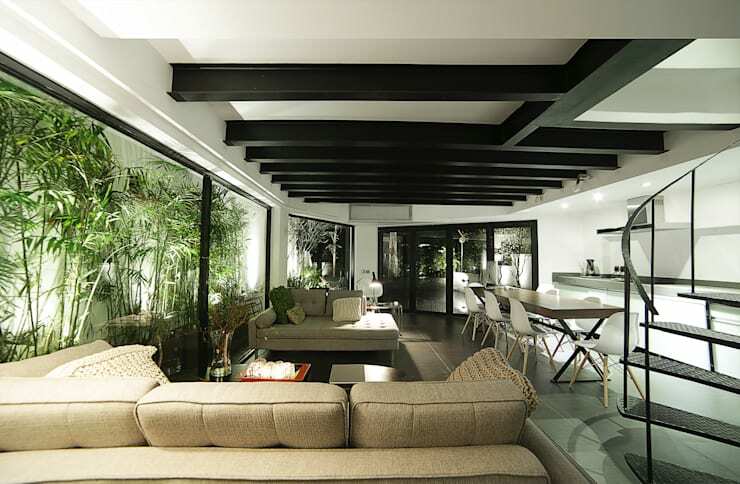 The greenhouse is truly a marvellous feature within this home, providing a sense of the jungle deep within the city. 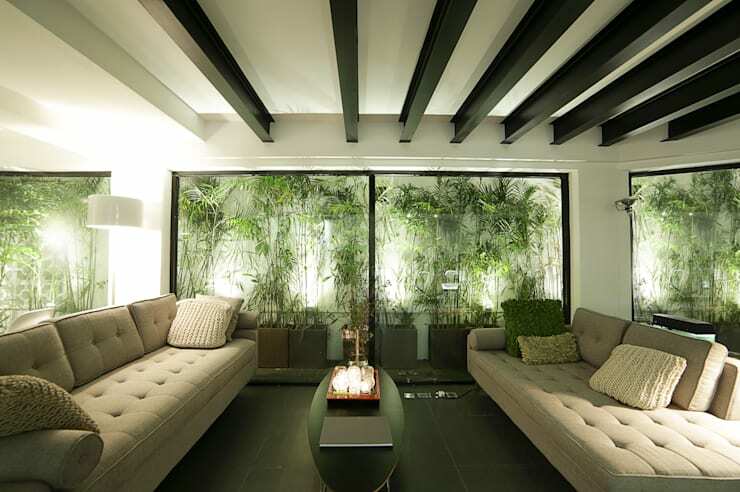 Ambient lighting within the enclosure amplifies the spectrum of green hues that draw the focus of the room. From this angle the stark, black beams run parallel across the ceiling, also helping to draw the gaze of onlookers down towards this beautiful, natural design feature. The lounge suite makes no attempt to compete with its striking surroundings, simply laying in wait to accommodate relaxation and socialising. The kitchen and dining area of the home are streamlined and sophisticated, presenting a sense of style and functionality. A polished concrete kitchen bench adds another industrial element to the space alongside the sheen of the black, steel beams and spiral staircase. The simplicity of the dining room setting echoes the understated furnishings of the living room, resting in understated humility while the tropical spectacular of the greenhouse takes centre stage. 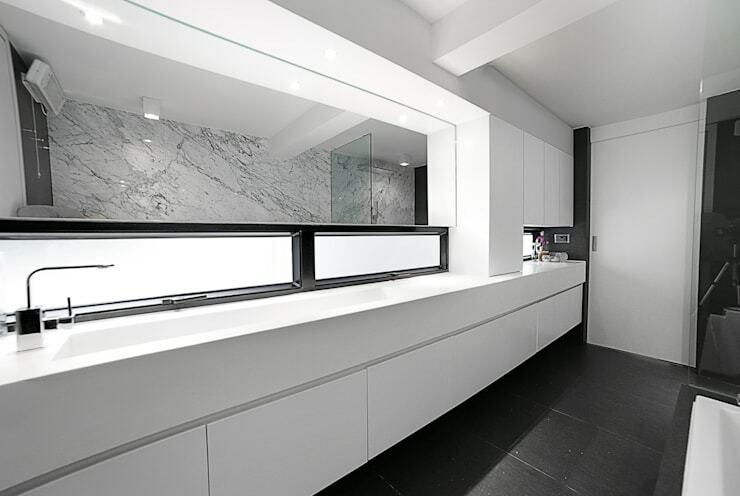 Moving through to the bathroom and we are immediately wrapped up in the sleek lines of a minimalist space, as the sheen of the black and white finishes and flooring once again play with duality of opposites within this design. The expanse of the space is extraordinary, with the sink running almost the full length of the white bench top , elongating the room in tandem with the large mirrors and overall linear design. Clutter has been kept to a minimum, with plenty of hidden storage throughout the lengthy cabinet, while spot lighting throughout provides the perfect conditions for a pristine bathroom experience. The piece de resistance of this magnificent bathroom is undoubtedly this veritable palace of a shower. Lined with a wall of luxurious, white marble, the shower gleams beneath its overhead lighting. 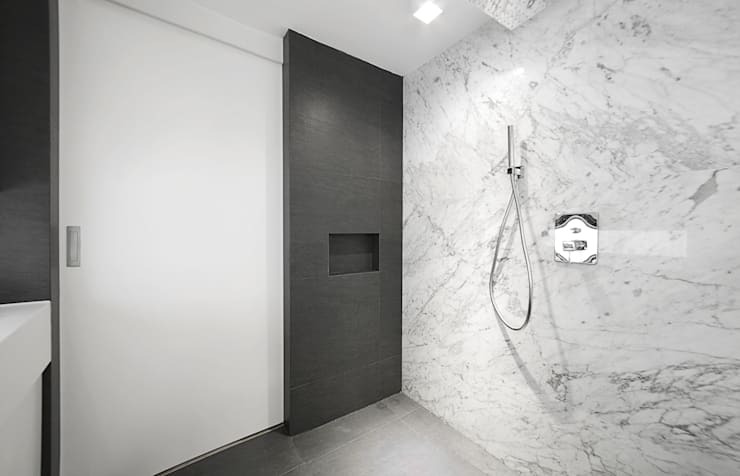 A simple, silver tap and shower head are the only features disrupting the hypnotic patterns of the smooth marble wall. Clutter is once again kept to a minimum, with space for toiletries limited to a small enclave in the contrasting, grey-tiled panel adjacent to the majestic marble. The exterior of this stunning home has not been forgotten, with an expansive courtyard included to capitalise on the subtropical Hong Kong climate. High white walls provide supreme privacy and also allow natural light to bounce about the space, maximising its utility well into the evening. Tiling and finishes have been kept minimal in line with the rest of the home's decor, with a small selection of pot plants providing hints of nature amongst the hustle and bustle of the surrounding city life. 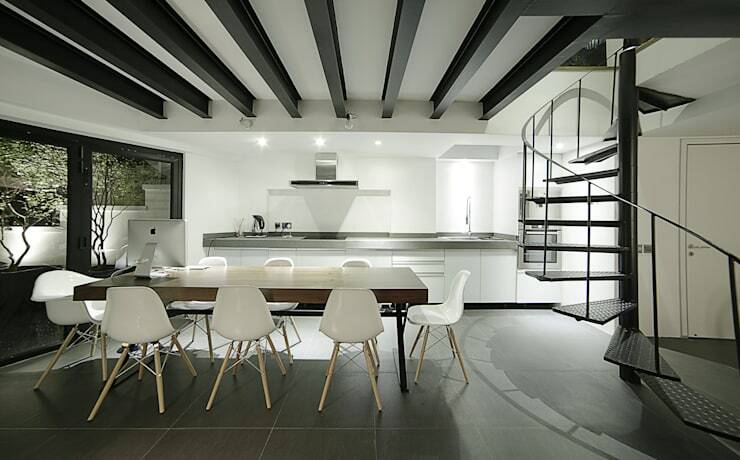 Wooed by this Hong Kong home? For more modern design inspiration have a look at Hwa Hun, Seoul! What do you think of this incredible house? Would you like to have a stunning, indoor greenhouse breathing life into your home? Tell us your thoughts!